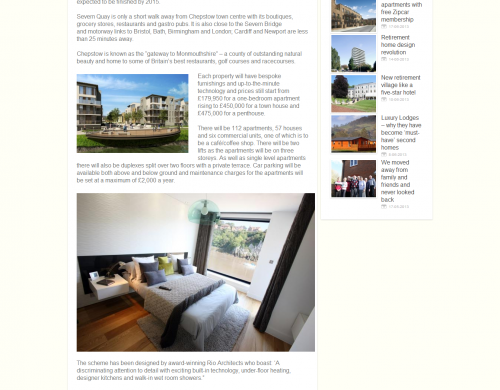 Palamedes PR has secured more media coverage for Severn Quay, the £40million riverside development in Monmouthshire. The agency, which specialises in property PR, secured page leads in the South Wales Argus, the largest regional title, and in RetireMove, a specialist source of property news. The coverage follows news that Severn Quay will open its doors to the public for the first time this week. Open Days will be taking place on Friday and on Saturday, giving residents, local VIPs and potential buyers the opportunity to explore one of the new townhouses on Lower Church Road.